Former Longhorns [tag]TJ Ford[/tag] and [tag]Kevin Durant[/tag] matched up Monday night and both had big games. Ford’s Pacers pulled out the win thanks in big part to his 11 fourth quarter points. TJ finished the game close to a triple double with 24 points, 10 assists, and seven rebounds. Durant kept the Thunder in it by leading all scorers with 37 points and chipping in eight rebounds. Video removed by ESPN! Bah. The New York Post is reporting that TJ Ford is being shopped by Raptors. Toronto has one point guard too many. 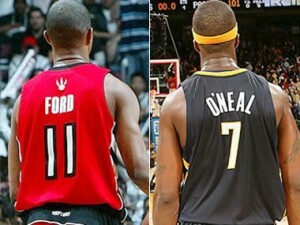 TJ Ford scores 21 points in 23 minutes in Raptors playoff win over Magic. Great game after two rough ones for TJ. For the third time since he left Texas, [tag]TJ Ford[/tag] had to be carried off a basketball court on a stretcher last night late in the Raptors win against the Hawks. Ford had played very well throughout game (26 points & 8 assists) when he stole the ball and was off on a breakaway late in the 4th quarter. Hawks’ forward Al Horford tried to stop TJ’s drive to the basket and reached out and nailed him across the face. TJ’s head snapped back from the force of the hit and then again when his body hit the hardwood. Horford was called for a flagrant foul and ejected for the play. It’s scary to watch TJ laying on the ground screaming in pain, especially because of his history. He looks like he is scared and in an incredible amount of pain. The good news is that he had feeling in his arms and legs when he was taken off the floor. He was expected to be kept in the hospital at least overnight, but there have been no updates yet this morning on how he’s doing. We’ll post any news as we hear it. Our thoughts and prayers go out to TJ for a speedy recovery.